Here in Minnesota, we’re known for our unique love of foods on a stick. If you’ve ever been to our state fair, you know what I’m talking about. Come hungry because you can feast on deep fried walleye on a stick, macaroni and cheese on a stick, even a deep fried candy bar on a stick! I’m down with the walleye, but some of the other options are just too out there for me. But not these Greek Salad Skewers. 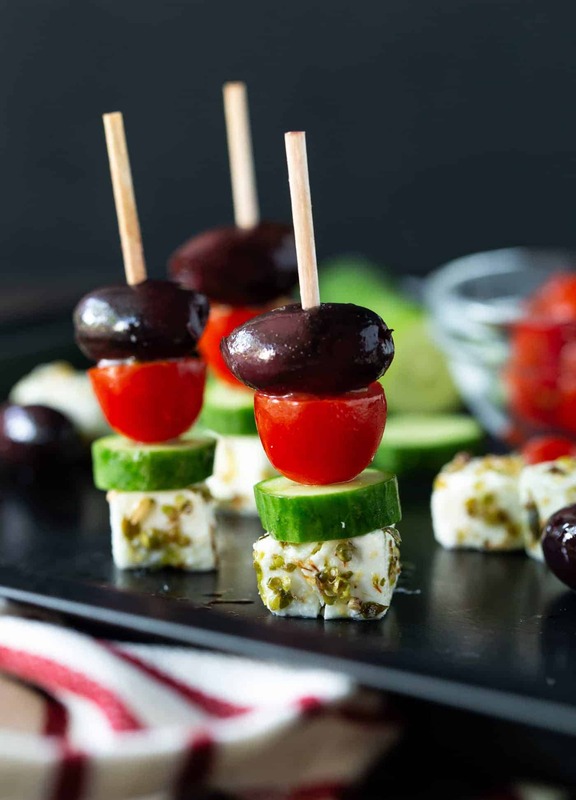 While you won’t find these at the Great Minnesota Get Together, they ARE made on a (tiny) stick and taste just like Greek salad in a bite-sized appetizer form. I love these skewers because a) they are obviously super easy to make, but b) they also travel well and can hang out at an afternoon barbecue without sacrificing taste. As summer produce starts rolling in, these are especially tasty bites with fresh-from-the-garden tomatoes and cucumbers, but really, you can make these tasty, refreshing nibbles all year long with just a few simple ingredients from the grocery store. Not all feta is created equal, so be sure to buy a firm block of feta cheese. It’s easier to cut and will not crumble as easily when skewered. It also helps to squeeze the excess moisture off the block before cutting it so the oil adheres to the cheese cubes better. Just like the feta cheese, your kalamata olives should be firm, too. I find the bottled variety to be a bit softer than the ones you can buy from the olive bar in the grocery store, so spring for those if you have the chance. The feta cubes can be tossed with oregano and olive oil up to a week beforehand and simply stored in the fridge. 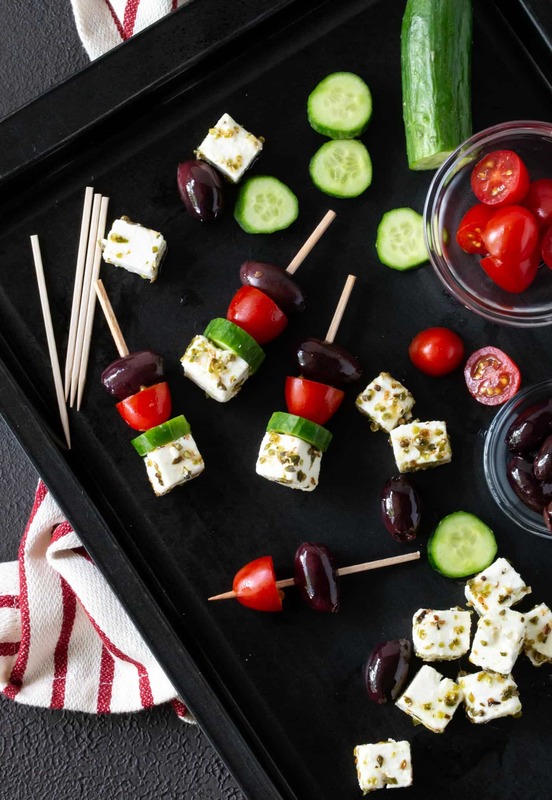 You can assemble these Greek Salad Skewers a few hours in advance, cover them and pop them in the fridge but plan to let them come to room temperature about 20 minutes before serving. Toss the feta cubes with a bit of olive oil and sprinkle with oregano. 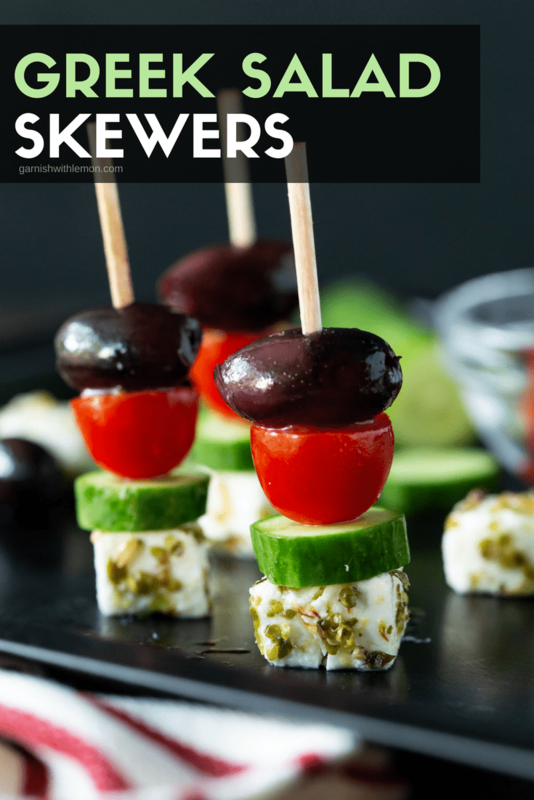 Thread skewers with olives, tomatoes, cucumber slices and feta cubes. Serve immediately or refrigerate until ready to serve. beautiful! and easy to make and eat! brilliant! Thanks, Mimi. Gotta love an easy appetizer! Nice idea, but I think I’ll place the cucumber on the bottom. I love how cute these are. They would be perfect for a cocktail party and popular. Popular is right; they disappeared very quickly from our house! These are right up your alley, Julia! These are incredibly cute. Pinned! Thanks, Leah. They are a bit hit with guests! I just love fun food on a stick!! This is a fabulous appetizer idea girls!!! I feel like food on a stick or miniature food always tastes better for some reason! So cute! Why is it food tastes better on a stick? I’m sort of a sucker for Greek food, I could probably eat a whole tray of these! I had no idea that people from Minnesota liked food on a stick. How am I going to insert that piece of knowledge into a conversation? Ha! I do like the mini bites you made. Easy to eat. Easy to fix. And dang cute. Love that I added to your trivia knowledge, Carol! I just discovered your website, and I am very impressed! These little beauties will definitely be making an appearance at the next Greek Family BBQ – FOR SURE! Thanks for your creativity and especially for sharing with all of us. So glad you found us, Chris! I hope you and your family enjoy the skewers – and other inspiration from our website! 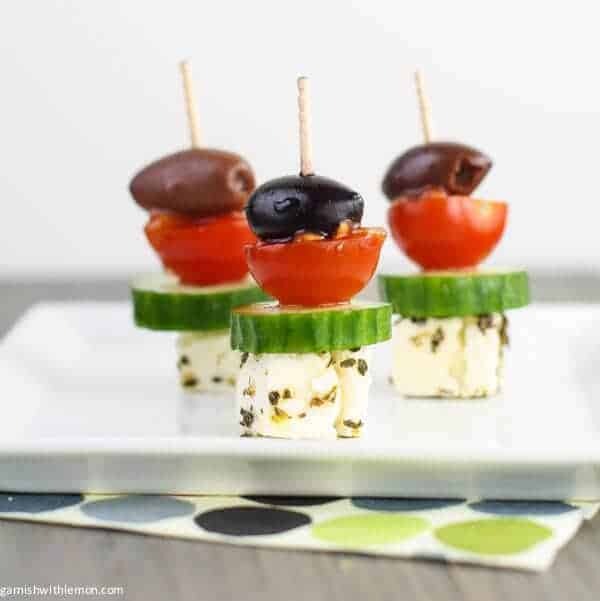 The feta cubes fall apart when I insert the skewer…. Hi Julie, that can happen sometimes, especially if your feta is really moist. Try squeezing out as much of the moisture from the brick of feta as possible before cutting into cubes. You might also want to try a smaller skewer. Hope that helps!